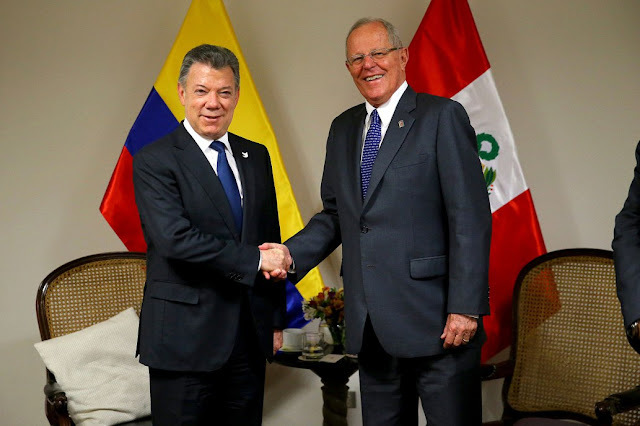 Colombian President Juan Manuel Santos (left) and Peruvian President Pedro Pablo Kuczynski. Peru and Colombia vowed to stand with Mexico as the country faces an uncertain economic future and grapples with a crisis with the United States just days into U.S. President Donald Trump’s administration. We the people of the United States just want peace and to stop worrying about being blown up and the u.s.has bent over backwards to oblige these not American people.They don't like Trump because he's not pocketing all the money that should go for things to better the United states,and I believe that he will be a great president completely watching over our country.We don't go around with our heads covered up or praying to some God.we pray to the only God in Heaven that we have.We don't pray allah or whatever they call him.So,please leave Trump alone to do his job for our country and if you are American and don't like it then please feel free to leave and stop talking about it as people are really getting tired of hearing it.I know that I am.